There are several ways to fight the signs of aging. One of the newest and most efficient is known as the Vampire Facelift. It uses the body’s resources to help aid in the rejuvenation and restoration process. Thomas Pulice, PA-C is a physician’s assistant who serves residents living in the greater Las Vegas, Nevada area. If you live in the area and are interested in learning about the Vampire Facelift and its list of benefits, call Las Vegas Aesthetics today and schedule an appointment with Thomas Pulice, PC-A at your earliest convenience. WHAT IS THE CONCEPT BEHIND A VAMPIRE FACELIFT? The Vampire Facelift uses the body’s resources to rejuvenate, restore, and heal skin. The process includes creating a serum from your blood and the natural growth factors that your body naturally produces. This platelet-rich fluid is injected into your tissues, providing them with the nutrients they need to thrive. The next step of the process is to use a dermal filler to stimulate collagen production. 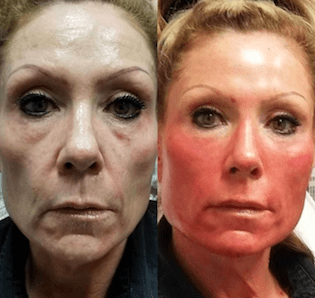 By using hyaluronic acid fillers like Juvederm® or Rystelane®, Thomas Pulice, PA-C can doubly enhance the effects of the platelet-rich plasma serum. While the PRP treatment starts the process, the use of the dermal fillers provides the added boost to make your skin fuller, younger, and revitalized. WHAT IS PLATELET RICH FIBRIN MATRIX? At Las Vegas Aesthetics, Thomas Pulice, PA-C collects up to five times as much blood as other practitioners. That means the matrix has more nutrients and can better supply the body with exactly what it needs to start and maintain the rejuvenation process. When used in conjunction with dermal fillers, your skin gets the nutrients it needs, plus extra collagen and elastin that helps to maintain the results for several months at a time. The Vampire Facelift offers long lasting results. The procedure uses injections instead of incisions, so the recovery time is minimal. With such a brief recovery time, the results from the dermal fillers can appear within the first few days. The rejuvenation process itself starts to take place in approximately three weeks and will continue for up to three months. The final results can remain for up to a year or longer. The Vampire Facelift procedure is considered an elective procedure by most insurance companies. If you have the financial resources, Thomas Pulice, PA-C recommends having the procedure performed on a regular basis to ensure optimum results. For some patients, this may mean every three to six months, while others may be able to go from six to nine months before needing a touch-up.